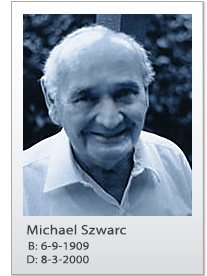 The pioneer of parylene conformal coating, Michael Szwarc, was born in 1909 in Bedzin, Poland. His academic career began at Warsaw Polytechnic Institute where he received a chemical engineering degree. Shortly after graduation, Szwarc married and started his career as a chemical engineer. In 1945, he received the first of his first doctoral degrees, this one in organic chemistry, from Jerusalem's Hebrew University. In 1947, Szwarc discovered the parylene polymer as one of the thermal decomposition products of the common solvent p-xylene at temperatures exceeding 1000 °C. Szwarc first postulated the monomer to be para-xylylene, which he confirmed by reacting the vapors with iodine and observing the para-xylylene di-iodide as the only product. Swarc's reaction yield was small, and a more efficient route was developed later by William F. Gorham of Union Carbide. Szwarc continued to work well into his 80s. Michael Szwarc, of Solana Beach, CA passed away in August of 2000 at the age of 91, leaving a wife, one son, two daughters, five grandchildren, six great-grandchildren and an incredible legacy of new fields of polymer science that include the Parylene conformal coating valued in virtually every industry.